KCABJ sent out no applications in March, seeking students for the KCABJ Urban Student Journalism Academy. Only one application had been received during each of the last two years, forcing the cancellation of the summer journalism advancement program. KCABJ members will brainstorm about ways to possibly attract students in 2020 to the free program, which also offers college scholarships to the top graduates. KCABJ members also will regroup in May for a membership meeting. NABJ President Sarah Glover also was honored by Rev. Al Sharpton and the National Action Network (NAN) earlier this month. Glover was recognized by the civil rights activist, talk show host and minister during the Women’s Empowerment and Networking Luncheon held at the NAN annual convention in New York City. According to NAN, Glover was saluted for her journey as a journalism professional and leader fighting for diversity and inclusion in the media industry. NABJ is gearing up for its inaugural #NABJTechTrek: Goes to Silicon Valley. NABJ will host industry leaders and journalism students to produce news that fosters innovation and diversity in emerging technology and build meaningful sources for accurate reporting. During this first-of-its-kind media institute, participants will visit Apple, Facebook, The Athletic, NerdWallet, LinkedIn, Uber and many more. Attendees will also gather at the Medill School of Journalism for presentations, trainings and networking sessions with Reveal, ION 360, WIRED, Design at Apple, Swaay App, Madia, Kai Frazier and more. Attendees who successfully complete the LinkedIn for Journalists training during #NABJTechTrek will receive free LinkedIn Premium service for one year. Attendees will also learn about issues in tech affecting the black community and meet emerging black tech entrepreneurs. For more information go to https://www.nabj.org/events/EventDetails.aspx?id=1165465&group=. Spaces are limited. A low turnout at the monthly meeting of the Kansas City Association of Black Journalists left unresolved key issues about the organization’s student academy, programming and its future. Those concerns were tabled and will be taken up at the April meeting. National Association of Black Journalists has targeted CNN for “its lack of black representation within the ranks of CNN’s executive news managers and direct reports to CNN President Jeff Zucker,” NABJ said in a prepared news release. The National Association for the Advancement of Colored People supports NABJ’s call for a civil rights audit of CNN and an examination of the cable news network’s executive level diversity. In addition, Color of Change, a national online force driven by more than 1.4 million members, is joining NABJ and the NAACP in seeking the audit and upper-level diversity probe of CNN. The NABJ news release continues: “This concern, coupled with Zucker’s refusal to meet with a four-person NABJ delegation, has prompted NABJ to place CNN on a special media monitoring list. “A special team will perform further research and an analysis of CNN’s diversity, inclusion and equity practices, per the NABJ Board’s directive. The special team will also publicly report on identified deficiencies in hiring a diverse workforce in news decision-making capacities at CNN. NABJ is also calling for a civil rights audit that examines the company’s hiring, promotion and compensation practices involving black employees. CNN President Jeff Zucker has no black direct reports. There are no black Executive Producers at CNN. There are no black Vice Presidents on the news side at CNN. There are no black Senior Vice Presidents on the news side at CNN. “NABJ received a communication from CNN disputing only one of our research points, saying the assertion that there are not any black vice presidents on the news side is inaccurate. However, when asked to provide the name and position of the individual or individuals involved on the editorial side of news, CNN has yet to provide specifics. “In addition to special media monitoring activities and the civil rights audit, NABJ’s next steps involve further engaging with CNN’s parent company, AT&T, which has responded positively to outreach efforts and previously agreed to meet with NABJ. “NABJ’s delegates are already engaged in very positive outreach with several other media companies and have met or have scheduled meetings with Fox, CBS, NBC and ABC. NABJ believes those companies see the value in such meetings and appreciates the respect those companies are showing for the positive intent of our efforts. “The NABJ four-person delegation has attended previous meetings with other media companies. The delegation requesting a meeting with Zucker includes President Sarah Glover, Vice President-Digital Roland Martin, Vice President- Broadcast Dorothy Tucker and Executive Director Drew Berry. “Zucker’s refusal to meet with the full delegation is based on a personal issue between CNN and NABJ’s Vice President-Digital Roland Martin. The issue stems from Martin’s participation in a 2016 town hall meeting with Democratic presidential candidates Hillary Clinton and Bernie Sanders. Previously, former Democratic National Committee Chair Donna Brazile admitted she inadvertently disclosed a town hall topic to the Clinton campaign that was part of Martin’s research inquiry for the town hall. The deadline for early bird registration for the National Association of Black Journalists convention was March 1. People planning to attend the convention Aug. 7-11 in Miami will be able to pre-register through June 1. The cost ranges from $275 for students to $550 for nonmembers. Discounts for NABJ members who also are with an affiliate chapter must be mailed or faxed into the NABJ office for verification purposes. For more information, go to https://www.nabjconvention.com/NABJ_Registration.cfm. NABJ and Columbia University are offering scholarships to students to attend the Miami convention. NABJ student members are encouraged to apply for a grant to help offset costs associated with the annual convention. The Columbia University Graduate School of Journalism is providing five partial scholarships to the 2019 NABJ Annual Convention and Job Fair in Miami. Each fellowship winner will be awarded a $750 grant from Columbia to assist with travel and convention registration costs. Fellowship applicants must be members of NABJ to be eligible. The application deadline is March 29. For more information, go to https://thenabj.wufoo.com/forms/2019-nabj-columbia-journalism-school/. NABJ members seeking a position on the NABJ Board of Directors, including incumbents, must go to the link below and complete the form, including a letter of intent, a signed candidate’s agreement, biography, employment/university verification (requirements in PDF format) and a headshot by March 25. For more information go to https://www.nabj.org/page/2019EleDeclaringCandidacy. March 29-30: NABJ Media Institute on Health and Education – Washington, D.C.
May 1-4: NABJ Goes to Silicon Valley Tech Trek – Bay Area NABJ is offering a producers data base to help provide the news industry with talented black media professionals. For more information, go to https://thenabj.wufoo.com/forms/r1eh16681xh8lst/. The request for proposals is open through March 22 and awardees will be notified by April 5. For more information go to https://www.nabj.org/page/RFPNotice. NABJ is seeking proposals for the development, creative and project management services for a new app and a mobile-optimized website. The goal is to enhance the organization’s presence and brand online, as well as provide a more user-friendly mobile experience that aligns with today’s media landscape. The goal of this project is to maximize web-based technologies; enhance membership, participant and partner relationships and engagement; improve program delivery and service; increase awareness and access to NABJ; promote involvement through programs; and improve business efficiencies. NABJ Special Honors and Hall of Fame Awards are open through April 8. For more information, go to https://ww5.aievolution.com/nbj1901/index.cfm?do=cnt.page&pg=2008. For more information about NABJ’s scholarships, please contact jriley@nabj.org. To apply, go to https://www.nabj.org/page/2019NABJScholarships. KCABJ picked up two renewing members: Lewis Diuguid and Bette Tate-Beaver. We’re looking for a passionate, sensitive writer interested in exploring human development issues through a particular prism. Global Sisters Report, an award-winning website publication of National Catholic Reporter, is hiring a regional correspondent for Africa/Middle East. We’re looking for someone to write about the varied missions and ministries of Catholic women religious in Africa with context, depth and detail while being able to convey “big picture” themes about human development. Ideal applicants will have experience with international reporting and the ability to manage multiple deadlines and roles within the newsroom. The preference is to have this person based in the region and able to travel frequently to other African countries and occasionally to the Middle East. Responsibilities include reporting trips to countries in the region, with the expectation of 5-8 stories out of each trip, along with shooting photos and some video. Stories for National Catholic Reporter (GSR’s parent company) may be expected/assigned on occasion. Candidates must be available when not traveling for a weekly video conference meeting with the staff in the GSR home office in Kansas City, Missouri. Candidates must also recruit and manage freelancers, help develop specific country and regional story ideas, and provide initial edit(s) on stories before they are sent to a GSR editor and a copy desk for final edits. As regional correspondent, this person would also be responsible for promoting the Global Sisters Report website to sisters, including managing and expanding the GSR Whatsapp group and finding other creative ways to bring GSR content to sisters who may not have regular internet access. Please send a cover letter, resume and four to six writing samples to GSR Editor Gail DeGeorge – gdegeorge@ncronline.org – by Feb. 18. 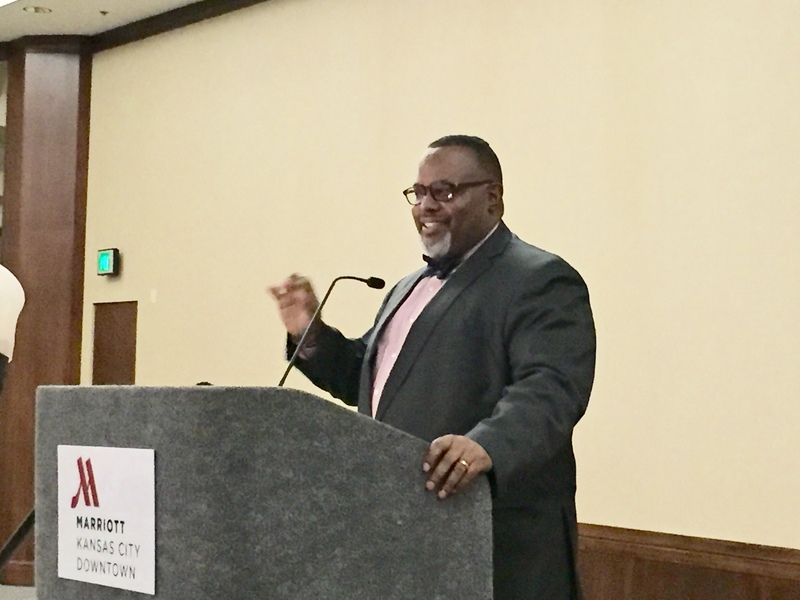 Glenn E. Rice, a former president and current vice president of the Kansas City Association of Black Journalists, speaks at the Southern Christian Leadership of Greater Kansas City luncheon in January. Glenn, a reporter for more than 30 years with The Kansas City Star, was honored with the SCLC’s Community Service Award. The luncheon was part of the weeklong celebration for the birthday of the Rev. Martin Luther King Jr.
Former Kansas City Association of Black Journalists President Glenn E. Rice will be honored Jan. 15, 2019, at the Downton Marriott Hotel at a luncheon that is part of the citywide holiday celebration for the Rev. Martin Luther King Jr.
Glenn Rice, an award-winning reporter with The Kansas City Star for more than 30 years, annually has been responsible for The Star’s production of a special section for the King holiday. The section features many of the weeklong SCLC events as well as other King holiday tributes throughout the metropolitan area and the two-state region. The publication also features special essays from people in the community, explaining what the holiday means to them. In addition to serving KCABJ over the years as its president, vice president/print and student journalism academy coordinator, Glenn has served the National Association of Black Journalists as its treasurer and regional director. Please plan to attend the luncheon to see one of our own honored. KCABJ did not have a monthly meeting in December. The meeting in January will focus on yearend financials for 2018, and members will be asked to discuss KCABJ’s future. Please plan to attend at 11 a.m. Saturday, Jan. 19 at Lutfi’s restaurant, 31st and Main streets. A notice will be emailed to members soon. Registration for the National Association of Black Journalists convention is now open. It will take place Aug. 7-11 in Miami and is expected to draw about 3,000 attendees. For more information go to https://www.nabjconvention.com/NABJ_Registration.cfm. Student Multimedia Project Applications are now available. For more information go to https://www.nabj.org/page/2019SEEDstudent. Students can now apply for the NABJ-ESPN Stuart Scott Internship-Scholarship. For more information go to https://www.nabj.org/page/19ScottIntern. The NABJ/NBC News Summer Fellowship Program is now seeking applications. For more information go to https://www.nabj.org/events/EventDetails.aspx?id=1181259&group=. It’s time to renew your membership in KCABJ. KCABJ members decided to give no media awards this year. The area news media have not generated enough material in 2018 that would merit a media award for enterprise journalism about African Americans and other people of color. That alone is a clear statement about the quality of journalism being produced by radio and television stations as well as the print and new media. African Americans and people of color are receiving deficient news coverage in the Kansas City area. The news media instead focus almost exclusively on publishing and broadcasting stories about crime and other stories that underscore all negative aspects about black people and other people of color. It is not surprising then that KCABJ members like Kansas City Star reporter Aaron Randle report on stories of explicit racism inflicted on African Americans, Latinos and immigrants in the Kansas City area. In this alt-right era with Trump as president, overt racism has found a welcoming home in the Kansas City area. KCABJ members at the October meeting decided against having a holiday party. The energy and resources instead will go to a membership drive in January during the holiday for the Rev. Martin Luther King Jr. or February during Black History Month. The National Association of Black Journalists will hold its 2019 convention in Miami from Aug. 7-11. JW Marriott Miami Turnberry Resort & Spa will be the convention hotel. Rooms at the hotel apparently are sold out. The overflow hotel is Residence Inn by Marriott Miami Aventura Mall. It also apparently has sold out. Two additional hotels for the convention are AC Hotel Marriott Miami Aventura and the Aloft Hotel Miami Aventura. They are within two miles of the host hotel. People who plan to attend the convention are asked to book their hotel rooms soon. NABJ President Sarah Glover announced that Sia Nyorkor has been picked as the new regional director for Region II, which includes Missouri and Kansas. Nyorkor is an Emmy and award-winning multimedia journalist for WOIO-TV, the CBS affiliate in Cleveland, Ohio. KCABJ President Lewis Diuguid has reached out to Nyorkor to welcome her to the post. Nyorkor can be reached at msnyorkor@gmail.com. NABJ is extending the deadline to Oct. 22 for its NABJ Multimedia Short Course at North Carolina A&T State University. The four-day intensive journalism workshop provides hands-on experience in multimedia journalism. To apply, go to https://thenabj.wufoo.com/forms/2019-north-carolina-at-multimedia-short-course/.